There are no recipe in this post, so if that’s all you’re here for, sorry to disappoint. However, I am going to show you what I made for my sister’s engagement party and how I displayed it. Partially as an explanation of why I disappeared for a couple of weeks, and partially in case you want ideas of something to make for a party. Edit: by request, I have added freezability (I don’t think that’s a real word) information to each item. Please comment or email me for more details. Firstly, the set-up. 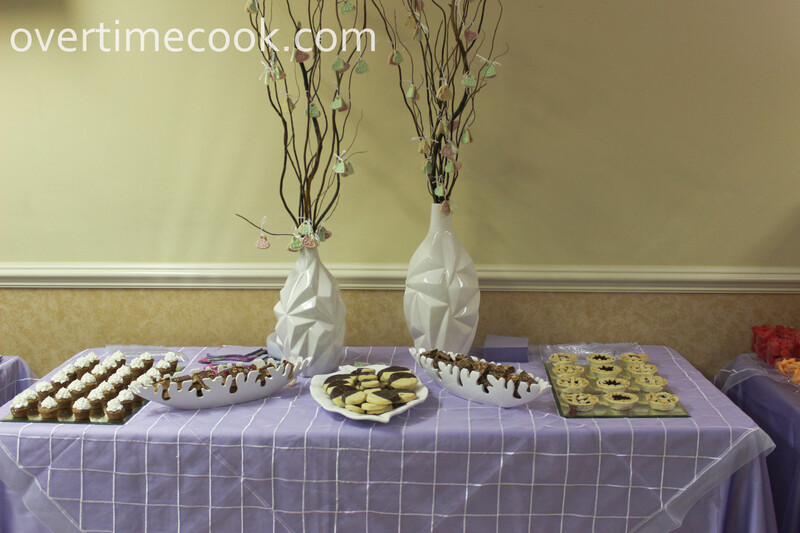 My mother, together with a family friend who helped with the arrangements got the tablecloths and arranged for people to make real foods. My job was the desserts. I set them up on three tables. 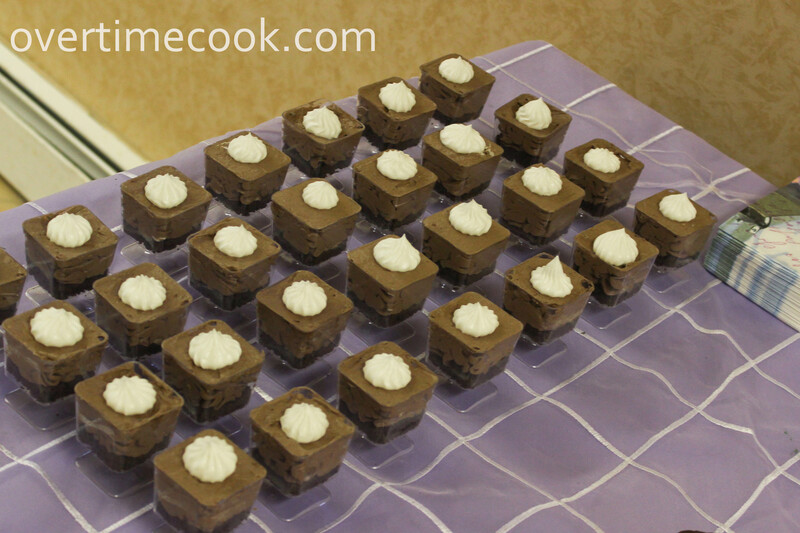 Mini Double Chocolate Trifles – I made these pretty much the same as the link, except that I piped the cream on the top differently. They were very popular, as always. Freezer info: I made these the day of the event, using brownie scraps from the heart shaped brownies, below. Freezer info: I made the cupcakes in advance and froze them. I made the frosting the day of the event. 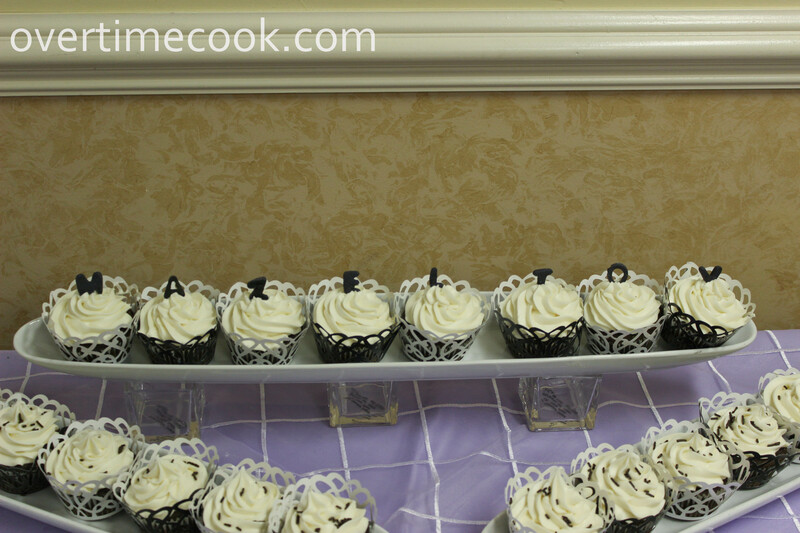 I made the fondant cupcake toppers a couple of days before the party and kept them in an airtight container. 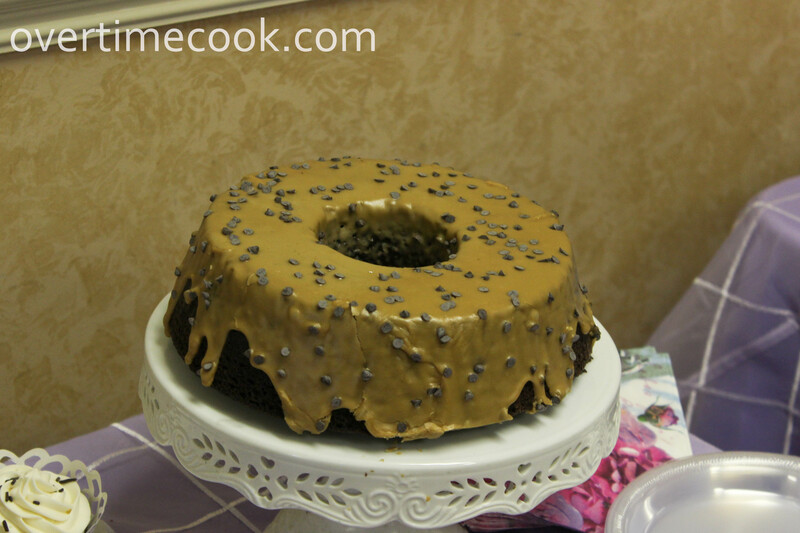 Mocha Bundt Cake with Coffee Glaze – this is a family favorite that I somehow never posted. (Must remedy that soon!) It looked nicer in real life than it does here, I promise! Freezer info: I made the cake well in advance and froze it. I made the glaze a couple of days early and kept it in the fridge. Glazed Raspberry Cookies – As I state in the original post, these are beautiful and easy to make. What more could I ask for? Freezer info: I made and glazed these in advance, and froze them. 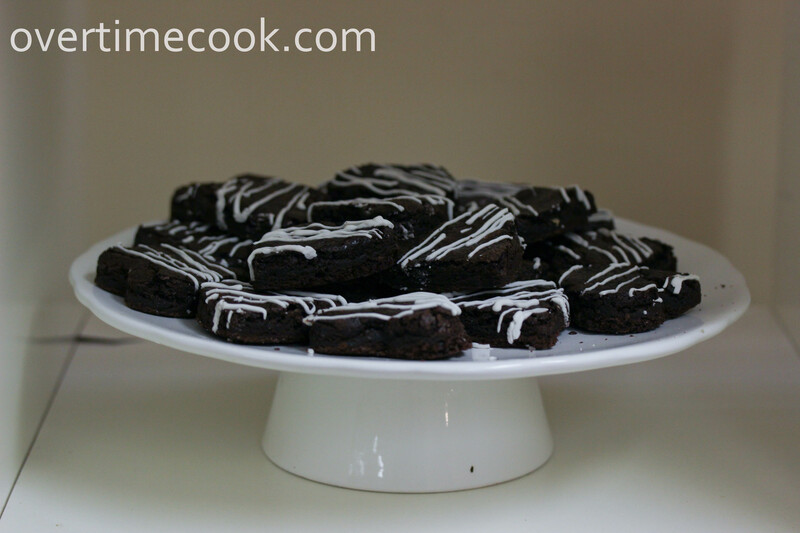 Triple Chocolate Oreo Chunk Cookies – Easy and delicious- real crowd pleasers! Freezer info: I made and froze these in advance. Mini Mocha Cheesecakes with Oreo Crumb Crust – One of the options on the original post was to bake them in mini muffin pans. Perfect size for a party, plus everyone adores this recipe. Freezer info: I made these and drizzled melted chocolate over them and froze them completed. 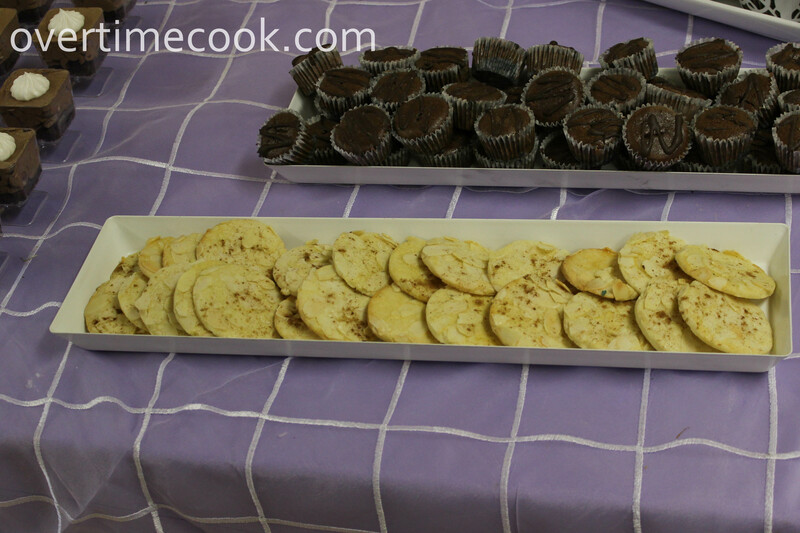 Almond Covered Sugar Cookies – I had extra roll out sugar cookie dough from the royal icing cookies, so I rolled it out, brushed it with an egg, sprinkled sliced almonds on it, dusted it with cinnamon and sugar and baked it. Simple and yummy! Freezer info: I made these in advance and froze them. Cannolis (for lack of a better word) – I used store-bought (don’t tell anyone!) 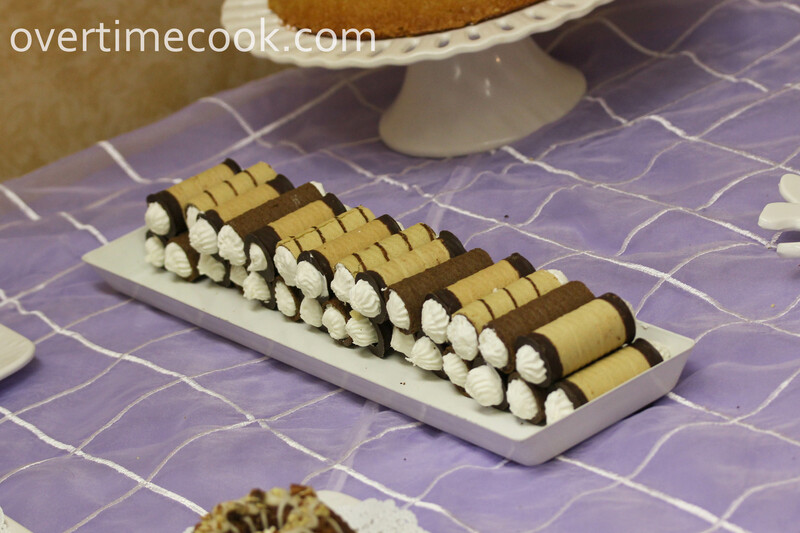 wafer shells, dipped them in melted chocolate, then filled them with sweetened whipped cream. Needless to say, these were super popular. Freezer info: I made these in advance and froze them. In fact, the freezer helped these keep their piped details nicer. 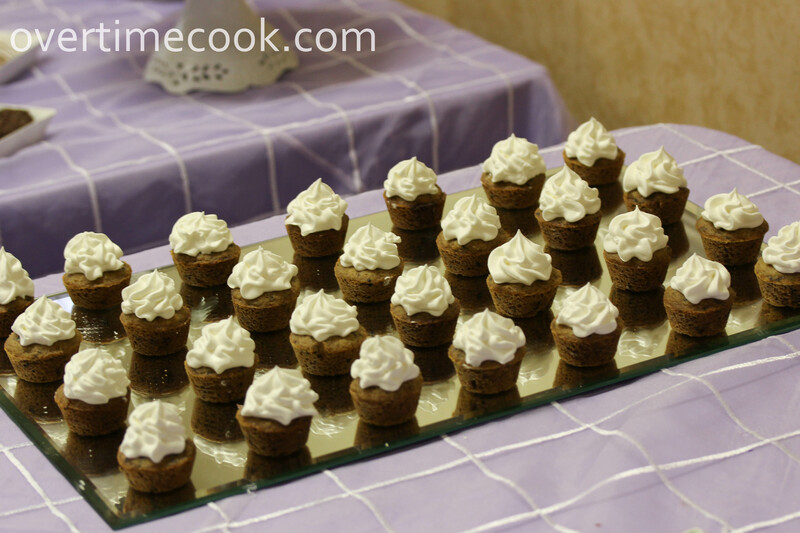 Cappuccino Cookie Cups – I made them exactly like the recipe, but I wanted to tell you a funny story. 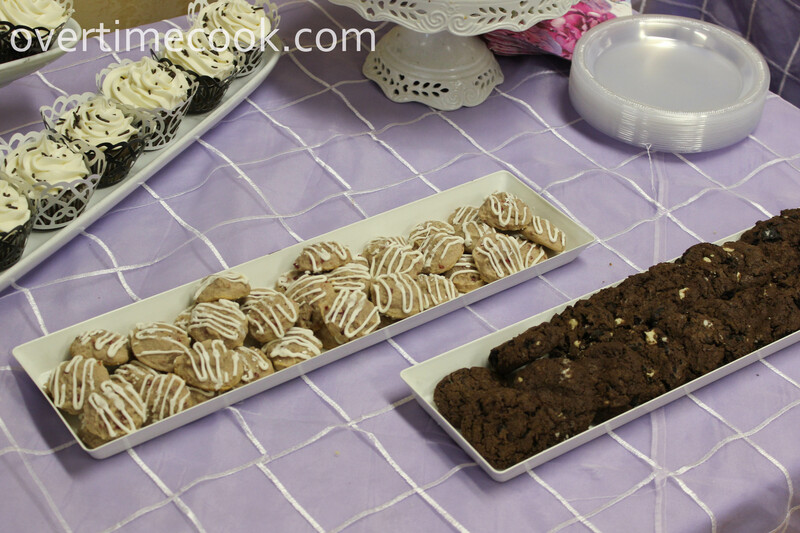 These were in the magazine the week of the party, ( I had actually made the cookies in advance and put them in the freezer, then stuck the cream on the day of the event.) Someone told me that she also saw them in the magazine and was thinking to try them. I was like “yeah, I wrote that.” I am a showoff at times, I guess I can’t help it. Mini Cherry Pies – I plan to post the full recipe eventually (along with some pictures that actually do these beauties justice!) but for now, here’s a link to my pie crust recipe, and a tutorial on making good pie crust. 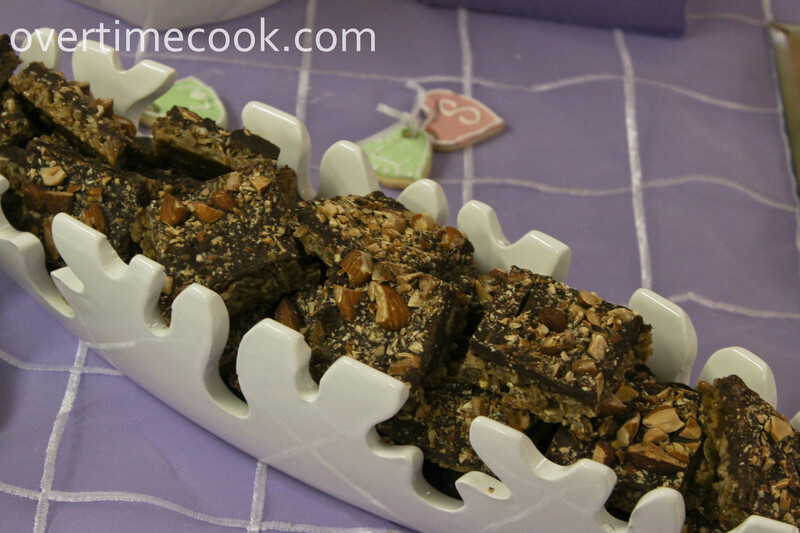 Chocolate Covered Oatmeal Bars – Again, easy, delicious and pretty. Are you noticing a theme here? Freezer info: made these in advance and froze them whole. I should have cut them up before freezing. Learn from my mistakes! Chocolate Covered Peanut Butter Candy Bars – I have to post the recipe one of these days, these were super yummy, and no bake to boot! Freezer info: I made these and froze them whole. Bad idea. See above. 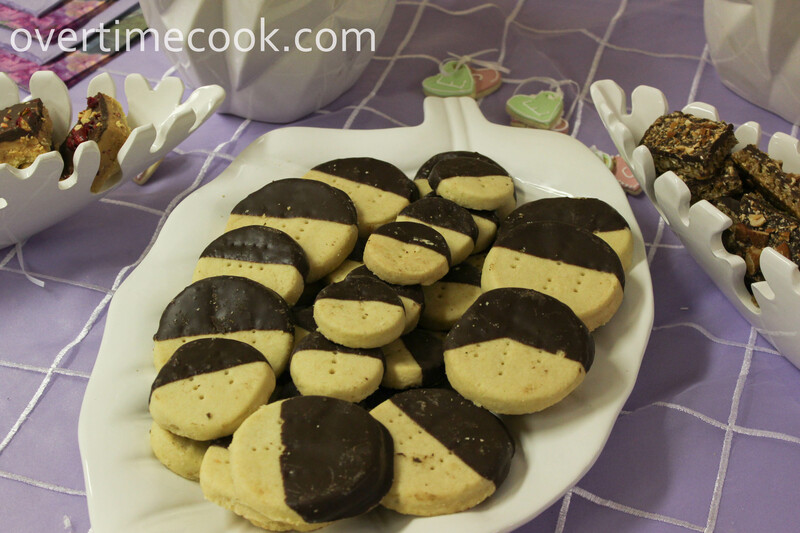 Chocolate Dipped Shortbread Cookies – These were my first venture into the world of shortbread, and I definitely plan to be back, with all kinds of awesome variations. Their flaky texture is amazing. Freezer info: I froze these already dipped in chocolate. Heart Shaped Brownies – The recipe isn’t as important as how I decorated them. I baked the brownies in a wider pan, so they were more shallow than average. Then I used a heart shaped cookie cutter to cut out hearts. The glaze is the same as the one I used for the raspberry cookies. I don’t know why I didn’t get a picture where you could actually see how gorgeous they were, so you will just have to take my word for it. Or make them and see for yourself. Freezer info: I made these and glazed them and froze them after the glaze set. And I used the scraps for the trifles. 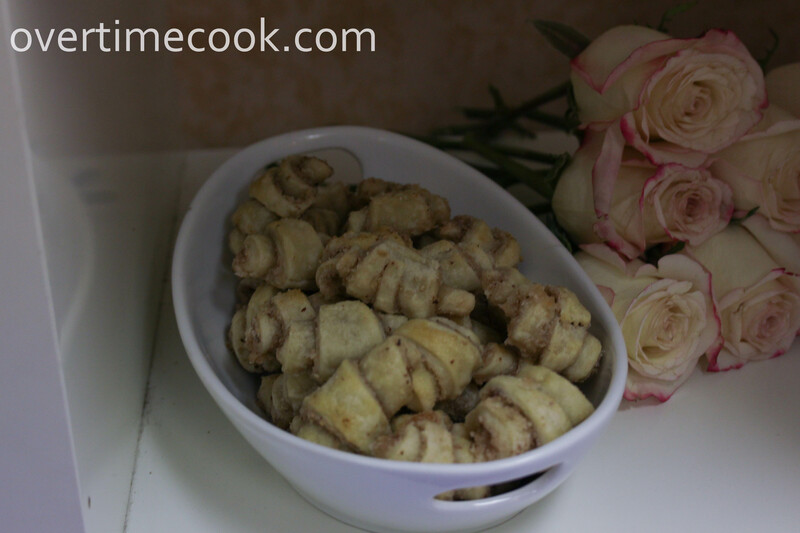 Rugelach – Another recipe which I will have to post eventually. Though these don’t really need an introduction or an explanation. 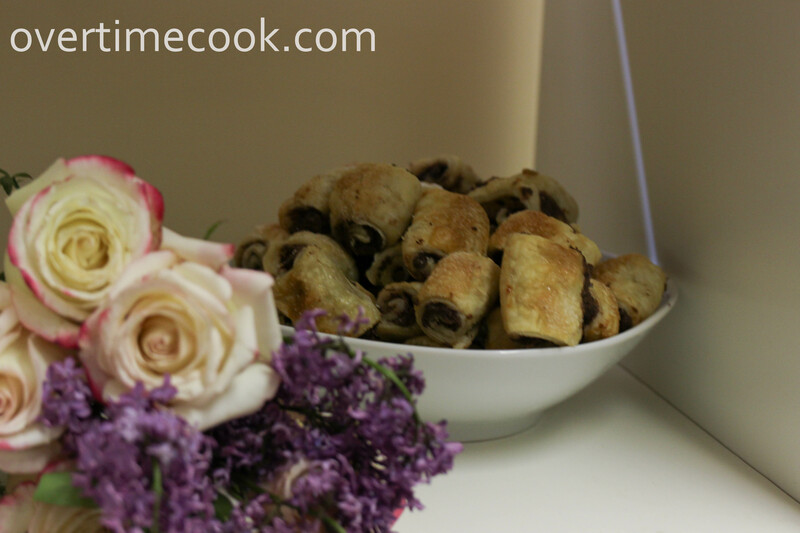 Nutella Puff Pastry Roll Ups – These Nutella Puff Pastry Pockets were one of the most popular posts ever on my blog. I decided to take them and make something bite sized and a little bit prettier out of them. This is what I came up with. As you can imagine, they were as popular at the party as on the blog. The fourth compartment was filled with a wafer cake that someone sent from a bakery. I won’t glorify it with any more blog space. 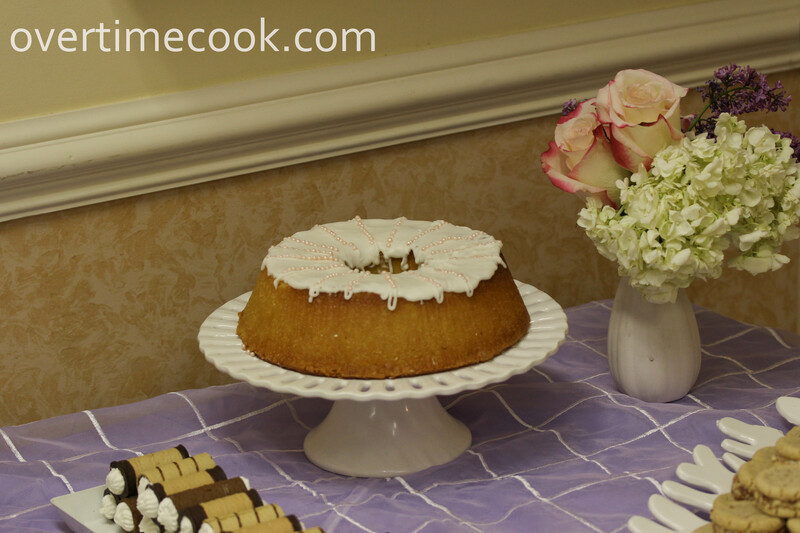 Vanilla Bundt Cake – another family favorite which I somehow never posted. It’s actually a real favorite of my sister (the bride) so I decided to make it. Those are pink sugar pearls decorating the top. freezer info: I made the cake in advance and froze it. I made the glaze a couple of days in advance and refrigerated it. I decorated it the night before the party. 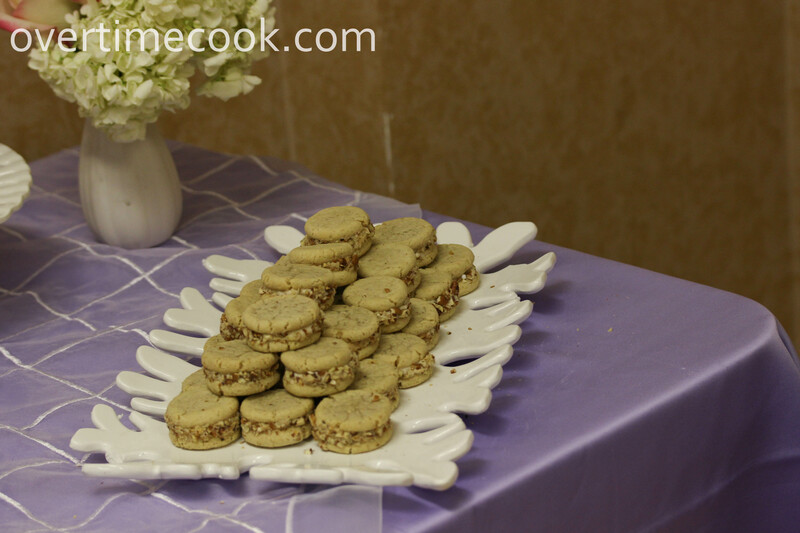 Maple Sandwich Cookies with Toasted Pecans – I made these mostly because they are so impressive looking, but you wouldn’t believe how wild people were over them. Not until you taste them, then you’ll be totally in love too. With a cookie. It happens. Freezer info: I made these in advance and froze them whole. Mini Maple Bundt Cakes with Bourbon Glaze and Toasted Pecans – Yep, these are every bit as good as they sound. You’ll have to take my word on that, because the recipe is my original one and I haven’t posted it yet. I’ll get there. Eventually. Freezer info: as with the other bundt cakes, I froze the cake, refrigerated the glaze and put it all together the night before. Anyway…that’s pretty much what kept me busy for the two weeks following passover. That and the cookies I hope to post next. And buying a new dress to wear, picking out paper goods, borrowing and collecting props, and some other things, such as working 9 hours a day and commuting 3 hours a day. No biggie. First of all, you did ALL the desserts for her vort!? What? Who does ALL the desserts? I hope they crowned you Superwoman for this. Second, I loved this post but would also like to hear which things you made in advance and froze (you mentioned it for one or two of these, but I’m sure there were more). Also, I would have been afraid to make cakes. At every party I go, people are hesitant to take that first slice and in general seem more likely to take something bite-sized/mini/that fits in your hand. How did the cakes go over? I added the information about what I froze and how. 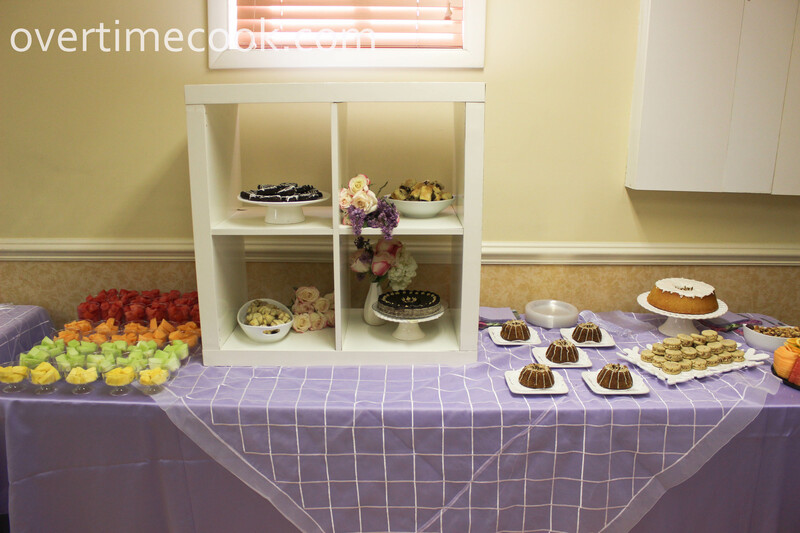 Regarding the cakes, youre right- they were the least eaten things at the party. 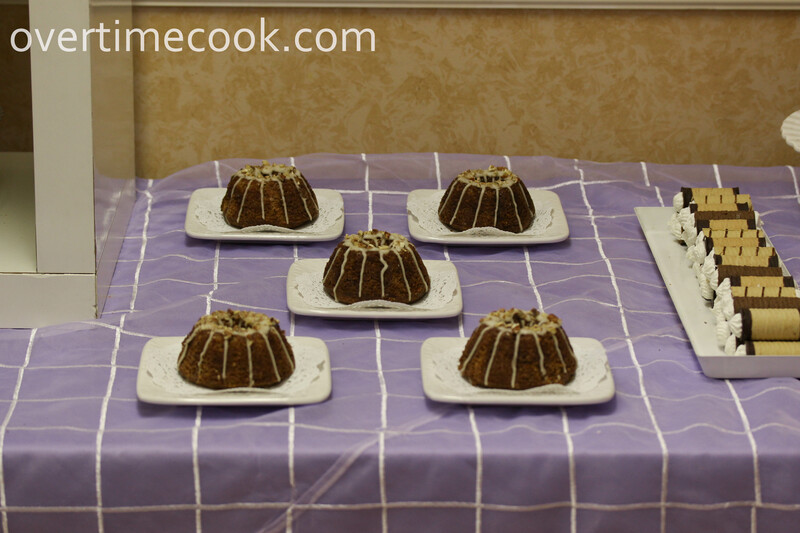 The mini bundts went over well, I’d do more of them next time. i think you did an unbelievable job! I can’t believe you baked all that!! I love your serving ware and how you set up the tables. You should be proud of yourself! Thanks Sina! Some of these were my own props, and the rest were borrowed. Beautiful little treats. 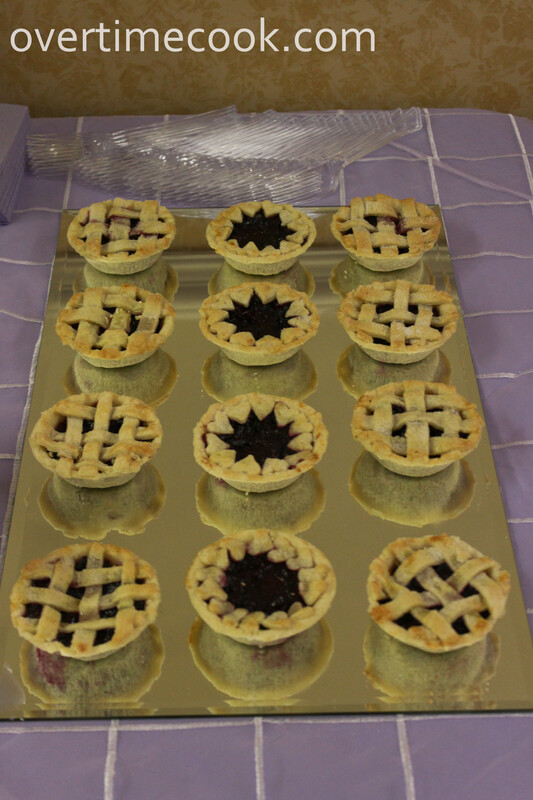 I love the designs on the tops of the mini cherry pies! Thanks Anna, I spent hours on them, I’m glad they were appreciated! All I can say is WOW!!!!! 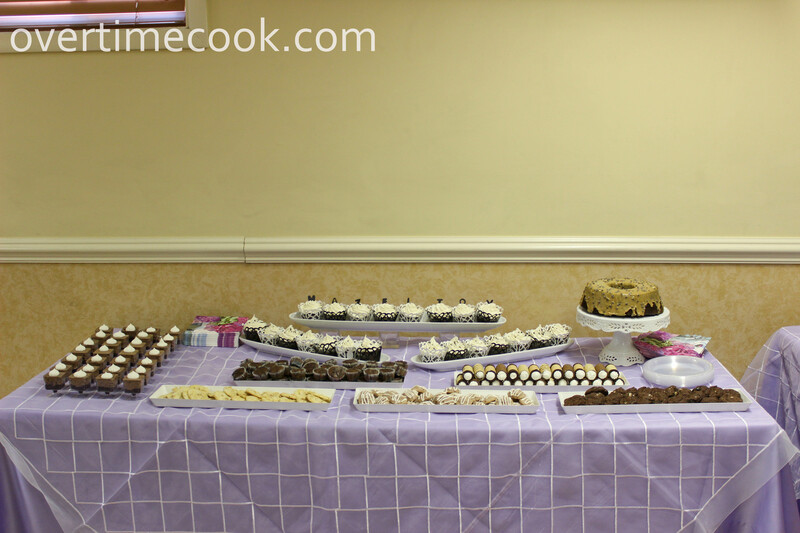 Miriam you’re amaaaazing for making ALL the desserts!!! And you made like 100 different types! Wish I could have been there to sample everything! Keep up the great work! Wow! Beautiful desserts. Love that so many could be frozen. Could you imagine not being able to do that? Question – How did you package the cookies when you froze them? Ziplock bags, Freezer paper? Stacked or single layer for the iced cookies? I wrapped everything in foil, then put it in an airtight plastic bag. The key to freezing things successfully is to make sure it’s well wrapped and completely airtight. Oh my goodness. You are A.M.A.Z.I.N.G.!!! Everything and I mean everything you made looks fabulous. I can’t believe you did ALL the desserts and your presentation of them all was beautiful. This is absolutely stunning! What an amazing talent you have! Wow! Where can I find the canoli wrappers/shells(in Monsey)? Would love to make them with dairy filling for Shavuos. I got mine in Rockland Kosher, in Monsey. They’re made by presidor and were at the end of the baking aisle. You are so freakin’ awesome!! I would have disappeared for weeks if I had to do all this too… Great job. And your arrangements of desserts looks gorgeous. I bet your sister was so happy to see all the work you put into it. Thanks Erin! She sure was! Wow, these all look amazing! I’m so impressed! amazing! you did a beautiful job. btw, wilton makes heart shaped brownie pans – no cutting required. Great job! Everything looks fantastic….and your pictures are amazing! 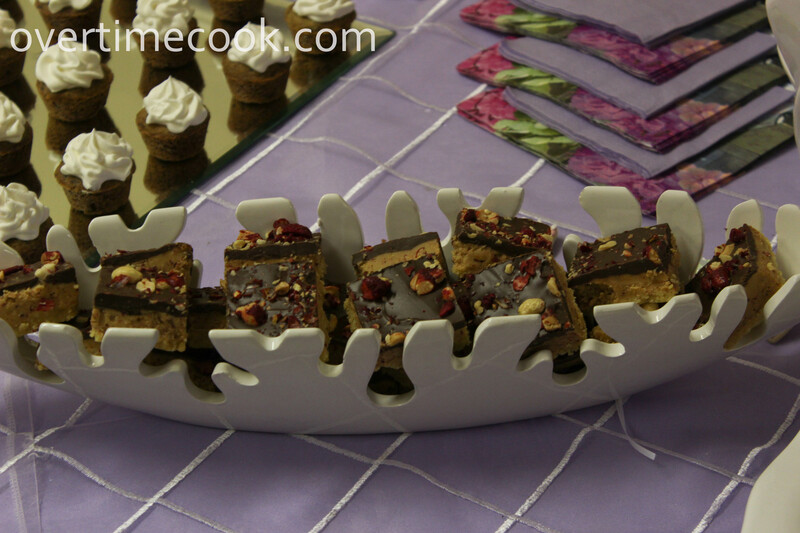 I know this is a bit random but I love the way you used the long rectangle trays to display the baked goodies! Are they plastic or china? I would love to duplicate the look for a party I am doing soon. (If it helps for a store reference – I am in Monsey). Thanks!! Hi! Love this post! I’m making a party in Feb and trying to figure out what I can make in advance and freeze! How long in advance did you make them? How long can I freeze them for and it will still be good? I’m doing most of the coking And baking myself so I want to start early! Tia! It was actually two weeks after pesach, so I couldn’t do anything more in advance than that. You can freeze up to about a month, make sure to wrap everything very well. How did you mak the cannolis? How do you make the filling? And you can keep it in the fridge until ready to serve ? Can you give the recipes for the mini maple bundt cakes with bourbon glaze.thanks!! !